On the evening the Chairman presented Abbie Todd with a Community Champion certificate and Kyran Richmond with a Performance Achievement certificate. The Enter CIC band known as Teenage Chorus comprised of Andrew Robertshaw, Jack Mylchreest and James Robson were also presented with Performance Achievement certificates for their outstanding contribution to the song entitled ‘Tell me what it’s like, a soldiers tale’. The song was a hit at Enter CIC’s Help for Heroes performance in July and can still be downloaded from itunes. The evening culminated in all children being presented with Enter CIC Christmas Community Performance Certificates and medals. The medals were funded by the 4 Together Partnership AAP and were presented by Councillor Brian Avery, Councillor David Farry, Lee Copeland Principal AAP Coordinator, Paula Nixon AAP Community Development Officer and Carole Payne Head of Early Intervention and Partnership, Children and Young People’s Services, Durham County Council. 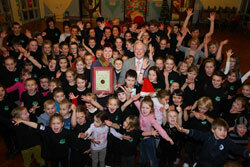 The children were excited and delighted to receive their awards and medals from the Chairman and local dignitaries. It was a lovely evening and a great celebratory end to the year.